Diamond Details: Pave set round brilliant cut and pear shaped white diamonds of G-H color SI clarity. This riveting Simon G antique style platinum engagement ring setting and wedding band set contains pave set round brilliant cut and pear shaped white diamonds of G-H color SI clarity. Caviar beading creates the unmistakable antique style effect. 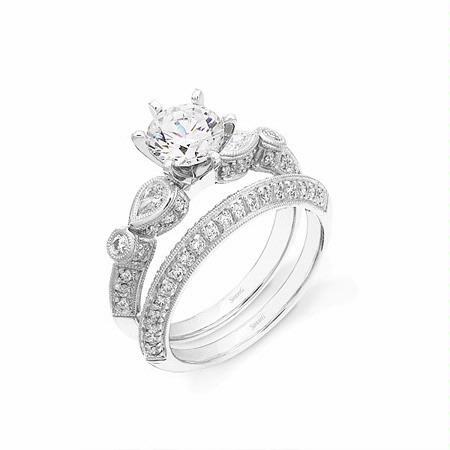 This bridal ring set won a poll on BRIDES Magazine's Facebook page. Simon G rings may be ordered to any finger size. Simply allow 3-4 weeks for delivery. We carry an extensive selection of separately sold G.I.A. certified diamonds to nestle onto the center of your beckoning setting. View our inventory of loose certified diamonds.